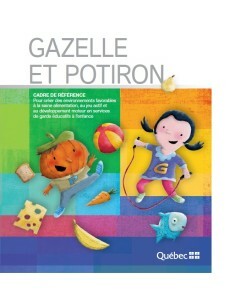 Following the launch of the framework Gazelle and Pumpkin (for favourable environments for healthy eating, active play and motor development in educational childcare childhood) in winter 2014 by the Ministry of Family, The Heart and Stroke Foundation of Quebec conducted a consultation process with the Ministry of Family to adapt and modify the Healthy Beginnings for Preschoolers 2-5 program to ensure it was complementary to the resources launched by the ministry. Recipes, games and activities suggested in the Healthy Beginnings 2-5 program help early learning practitioners implement practices that follow the guidelines and framework set out in Gazelle and Pumpkin. Feel free to adapt the proposed tools to meet your needs and promote the development of a healthy and active environment in your early childhood center. 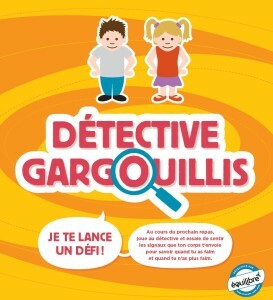 Balance developed “Detective Squish”, as an interactive family activity. This tool allows parents to help their child to be more responsive to their signals of hunger and to better understand the division of responsibility in terms of food. The role of parents is to provide a variety nutritious food to the child, a pleasant mealtime environment. The child is responsible for determining the amount of food he wants to eat, based on their signals of hunger. Discover other tools and such as blogs from our experts to help your child develop a healthy relationship with body and food, monequilibre.ca.